MainStreet Property Group and Grosvenor broke ground on their first co-investment project, The Bond. 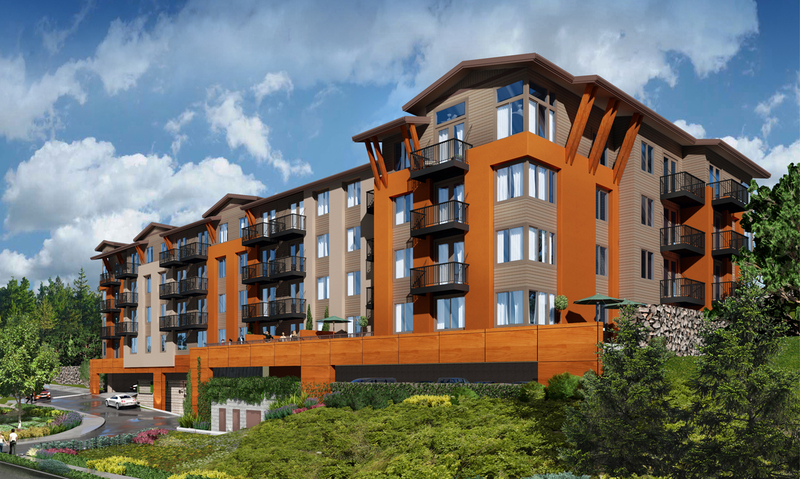 Located in Redmond, Washington and designed by DAHLIN, The Bond is a five-story, 139-unit multifamily for rent development that maximizes the allowable density while preserving half of the site as urban forest. Inspired by Redmond’s vibrant urban core and stunning natural beauty as well as the site’s adjacency to the newly minted urban forest, the architectural style features rural design elements that integrate an urban edge. Offering both market-rate and affordable housing, young professionals, established professionals, those downsizing and families, will find a range of housing opportunities – from studio units to one and two-bedroom apartments – in a sophisticated, comfortable and amenity rich community. The preserved forest on the south side of the project will shroud the community in the natural history of Redmond and homes on upper floors will feature Lake Sammamish, Marymoor Park and forest views. The Urban Forest concept driving the architecture represents modern living in nature. Thoughtful and expressive modern forms and natural materials capture Redmond’s essence as an urban oasis and the site’s natural beauty. The two proposed buildings are carefully placed with respect to the natural grade, views, solar orientation and preservation. The garages and site walls will create a terracing effect, controlling the grade and creating a natural experience for guests and residents. Views of the lake, forest and surrounding areas provide a natural amenity for the project while western warmth and light will activate amenity spaces. Features within the outdoor amenity area will include a sport court, barbeque, ping-pong and social space. Indoor amenities will include a fitness club and demonstration kitchen. Additionally, a view deck is planned on the fifth floor of one of the buildings. The modern living structures are characterized by generous glazing and a rich wood-inspired color palette. Modern forms enclose the glass amenity pavilion, which has a sophisticated skin of heavy timber and light lattice elements clearly referencing its surrounding forest and notable architecture of the region. Building entries have similar timber and glass features. Prominent concrete elements will incorporate surface treatments to beautify the material and to reflect the character of the neighborhood.